2 Why Is Your Website Down? 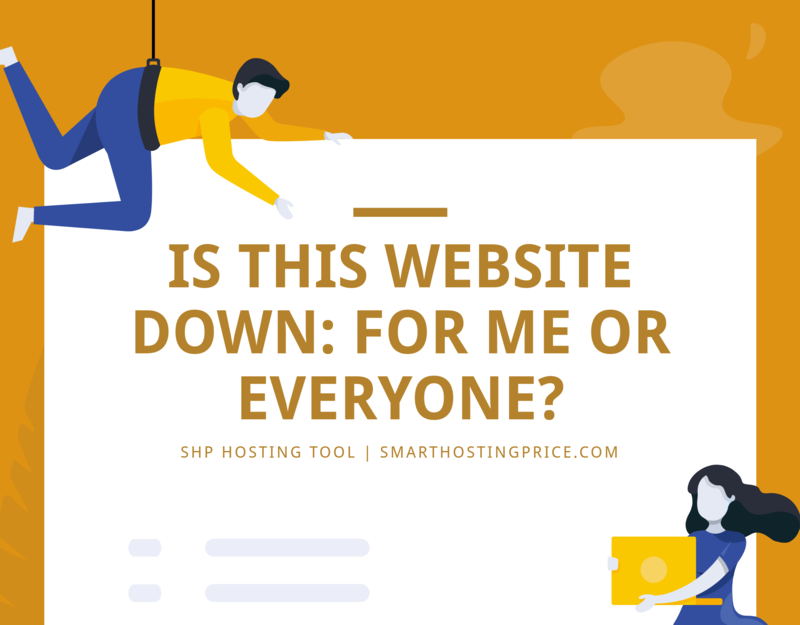 This is very intuitive simple tool that answers one of the most common question of the hosting business: Is This Website Down Only For Me Or For Everyone Browsing The Internet? There is a significant chance of the website being down only for you for many unknown reasons. This simple check will allow you to determine the actual status of the website. Here, we will simply use multiple servers that send a series of requests to the website searched here on this page. After performing the search, you’ll be able to finally figure out if the website down only for you or everyone else on the internet as well. We at SmartHostingPrice have worked hard to carve out a tool that will help you endlessly in determining if any particular website on the internet is down just for you or for everyone else on the internet. All you need to do is enter the website’s name carefully in the empty box and then simply hit the ‘Check’ button for the process to go through. Why Is Your Website Down? Whenever any website is down, it usually means that there is a problem with that particular website’s servers or DNS’ servers. Although, it is the responsibility of the company hosting the website to serve their clients. However, while the company’s server is down, your website faced downtime issues. You might notice messages being displayed on the screen such as ‘Server Not Found’ or ‘Error 404’ and many such messages. It is always tough for people to deal with such issues and always leads to loss of users active on the website. Is This Website Down: For Me Or Everyone? It can be either scheduled or at an immediate call. However, it is necessary for any updates related to hardware as well as security. Most of the times, users are notified before the maintenance, or the websites usually do this when there is minimal traffic like at midnight or early morning. Sometimes there are a few issues with servers that the fans bust or circuits get burned. It is always an easy option to fix the part which is not working correctly. However, when it’s not under the control of the developer, it is up to the UPS to handle the situation. There are situations when the former owner of a website changes the IP address without informing the current owner and doesn’t communicate with the web servers. Also, there are times when DNS expires, and no one renews it. Whenever the site gets popular, there is a chance of heavy traffic. For instance, you posted something controversial or any stuff which go viral; there is a need for planning. You can manage the situation if you have some backup servers in the line or it would result in chaos. In most of the companies all over the world, there are specific locations where are the servers are physically located. These locations are called data centers, and if there is any technical difficulty, there are huge chances of your site to get down. It is the most unfortunate scenario in which your site gets hacked by a third party. This situation mostly arises for slimy malware programs which makes their way to your PC and disturb the working. However, you can prevent this from happening is by making sure that your password is secured and you’re not clicking on every ad you come across. As mentioned before, there are numerous reasons why your website is down. Without further ado, let’s read about the common errors which get displayed on the screen while interacting with website servers. Any certificate error whether it is an SSL error or security error depicts some problem with the HTTPS encryption. To prove them to be legitimate, different websites have to present certificates while using HTTPS encryption. For instance, a trusted certificate authority issued a security certificate to Google. This gives them a verification from the authority that they are the sole owner of their website. So, whenever you connect to Google with the help of HTTPS, it will automatically present this certificate to your browser so that it can ensure the legitimacy of the website. Therefore, whenever you see a certificate error, it is an indication that the site you are going to visit is not a legitimate one. Whether it is Internet Explorer or Google Chrome or any other browser, it will display phishing and malware warnings. It creates a list of dangerous websites, and whenever you try to connect to any of these, it will show a warning by displaying an error message. The reason why a website is on this list because of their malware content, or it is just a phishing site. Phishing sites are mainly created to steal personal details of the users such as credit card numbers and passwords. It is one of the most common errors you will see while accessing web pages. This error appears when you are trying to access a page which doesn’t exist. A possible reason could be the removal of the web page, or you have mistyped the web address. This error is sent to your web browser by the remote web server. Try typing it accurately or make sure you are going to the right link. There are some websites which tend to sound friendly on the Internet so that it doesn’t ruin the mood of the user. The developers can customize the 404 not found and other error pages on their websites. For example, some sites have a special Mario themed 404 error page. They mean the same thing but try to convey the message in a more friendly way. Another common error which everyone deals with often while accessing their web browsers is ‘Server not found.’ This error elucidates that you are trying to access a website which doesn’t exist or you have typed a wrong address. It is possible that you either mis-typed the web address, or your DNS Server is down. Another situation in which this error appears is when your firewall, proxy, or other settings are not configured right. People interact with this message whenever they are using Chrome or Firefox. If there is an ‘Unable to connect’ message on the screen, it means that your web browser didn’t receive the response from the website’s server while connecting despite being successfully identified by its DNS servers at the target location. However, it is possible that the reason why you see this message is that the website itself is down or facing any problem.